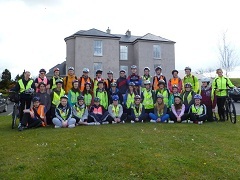 On Thursday last the 19th of April, 36 students from Gallen C.S departed Ferbane on their two day cycle around Offaly. The cycle had to be completed in order to receive the Bronze Gaisce Presidents Award and it had to be at least 100km in total. Before doing the cycle, each student had to do 1 hour a week in areas such as community involvement, personal skills and physical recreation. The cycle was a great success and all students made it to Birr for the overnight stay in the County Arms. On the Friday morning after a substantial breakfast, the students left Birr for the final leg of the journey home to Ferbane. Well done to all involved, students and teachers for completing this huge task. Last Monday Paul McDonald from STEPS Engineering Ireland visited our school for the second time this year. Previously Paul talked to fifth years and this time he spoke to all second years and the Transition years. Paul an engineer with the National Roads Authority spoke about all the different branches of Engineering and the opportunities that exist now and in the future for engineering and Science graduates. He showed some slides of Masdar City in the UAE and King Abdullah Economic City where major developments are going on to build sustainable cities. He emphasised that the urgent global need to find energy solutions that are both secure and sustainable is a challenge that requires a global response. He spoke about how “Liquid Gold” i.e., water and how we preserve, limit our usage and devise ways of providing food with water is a major challenge for Engineers all over the world. With the projected growth of cities in Asia and Africa over the next twenty years, the opportunities for graduates are huge. He concluded by encouraging students to therefore think about pursuing future education in science, technology or engineering. Councillor Sinead Moylan Ryan Visits Gallen Community School. Students in St Diarmids second year CSPE class invited Councillor Ryan to their class last week to speak to them about the work of a county councillor as part of their work into looking at how democracy works in action. Councillor Ryan explained how she got involved in politics and all the different projects she has promoted since being elected. She explained the membership of the County Council, their purpose and outlined the work they do. She also spoke about the difficult times over the last two years where central funding has been cut and this had affected services to the local communities. The students asked lots of questions. They were amazed at the time and commitment that is required as councillor. Sinead finished with a discussion of why more young don’t get involved in politics and reminded them of the importance of exercising their right to vote when they are 18. Liam Cooper on behalf of the class thanked Councillor Ryan for coming to the school and for her interesting and informative talk.